Hey girls, it feels like I haven't posted in ages! I hope your all having a good week. First of all, I would like to say R.I.P to the beautiful Elizabeth Taylor. She sadly passed away this morning due to heart failure. I remember when I was younger, I used to look at pictures of her and try and copy her make up. Not only was she an incredible actress, she was also one of the most breath taking actresses to ever grace the screen. I hope to age just as gracefully and as beautifully as she did. 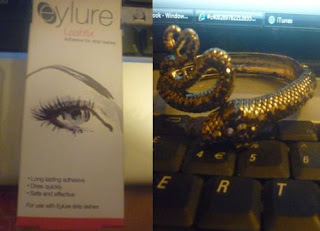 Anyway, I saw this eyelash glue by Eylure and at first I thought it would be something stupid like £6.00 or £8.00 but to my amazement, it was only £2.60! I haven't used it yet, but when I do I'll tell you if it was any good or not. LOVE the price so far though. The next thing I bought was a gorgeous snake bracelet for only £2.00 at Primark. It reminds me of Eygptians and I already don't want to take it off. The other news I wanted to tell you is...I'm starting Yoga classes tomorrow! I am so excited! I've been wanting to get in shape for ages now, but I have always been too lazy. But I am seriously going to focus on getting in shape for the summer. I'm currently 8 stone at the moment and I'm fine with that weight but I really just need to tone up. I'll tell you how it goes! i've also been wanting to take a yoga class... you definitely need to let me know how it goes!! have fun! Great blog love! I am now a follower!! that bracelet is well worth cheating and spending money! i love it! You picked out a very pretty picture of her!